As much as I like the Shu-shi pantheon and the implied culture, and as delighted as I am at the results, and as glad I am to have this pantheon drafted, I don’t mean this is the best Shu-shi article ever. Even if there is only one other to compare it to. It’s just the last one. That’s what ‘ultimate’ means, after all. What can I say? It is ‘U Day’ in the A-Z Blog Challenge. These are deities that are neither particularly auspicious nor particularly uncanny. Daio Wen is the god of runes and mystic writing, and the closest the Shu-shi have to a god of magic. Rather than the spectacle and mystery and grandeur of magic, though, Daio Wen focuses on more subtle and practical, pragmatic effects. His shrines are ideally placed on rocky mounds in forests and bamboo groves. They are open to the weather the pillars holding the roof are often painted or carved with glyphs and sigils of tranquility and protection. There are places for plaques to be hung for additional or specific purpose. Daily prayers are offered at dawn, ritually practicing calligraphy. Upon completion the sigil will briefly animate and disappear, leaving the surface clean for the next day’s calligraphy. Followers are known as Tuzhi, ‘drawings’, as they are themselves symbols of the world’s thoughts. Diao Wen manifests as a middle-aged Shu-shi with calloused hands and ink-stained sleeves. He is normally quite peaceable, but is frightfully adept with his iron brush and at need his drawings will come to life to serve him. Shouwei is wholly dedicated to protecting the Shu-shi, and has grown beyond many basic needs and desires. Shouwei is unfailingly polite and gracious, fair of face and temperament, but is now entirely asexual and close only to Jingcai as mentor and student. Shouwei’s shrines are refuges accessible to those in danger, offering succor and comfort to those who find their way peacefully. Any who would try to enter with negative intention will find themselves mazed and confused. Prayers are offered daily at dawn. Shouwei’s followers and Jingcai’s followers often share quarters or are located close to each other, and it is common for them to offer their prayers together as they train. Followers are called Baohuzhe, ‘protectors’. Being physically attractive is not a strict requirement, but a well-formed body is taken as an indicator of a well-formed mind and spirit. As much as is practicable without distracting from their duties, they are expected to do the best they can. Shouwei manifests as a beautiful Shu-shi wearing flowing silks cut to not inhibit movement in battle, and wielding a sansetsukon, a three-section staff. Jiaohua is seen by most as a protégé of Zhongli, and investigates mysteries for his patron. Few know that he is also the god of spies, those who seek to learn secrets others wish to hide. As an adjunct to Zhongli he is not accorded the greater respect received by the Jixiang, but is insulated from the discomfort that would reduce him to Bukeishiyi. His shrines seem to be simple libraries, where official but less important or sensitive information might be archived. They usually have covert entrances and exits, cunningly hidden spyholes and listening posts. Prayers are offered in midafternoon, after those to Zhongli are complete, partly to reinforce the perception of their relationship and partly because it frees Jiaohua’s followers to snoop during lunch. Followers are called Zhentan, ‘detectives’, for their investigative and deductive skills. Jiaohua manifests as a nondescript Shu-shi with ordinary, unremarkable features. Few remember him being present if they do not interact with him. This goddess of the sun is the daughter of Huanghou and heir presumptive. Lovely to look upon, well-mannered, but not yet mature enough to start rising to her inheritance. Qiangda is her mentor and lover, though presumably she will find another to assist when it is time for her to birth her heir. Her shrines are always in open areas, exposed to sun and wind and weather. They are primarily marked by symbols on the ground rather than actual structures. Prayers are offered daily at noon, when the sun is highest and brightest. Her followers are called Guangming, ‘brights’ or ‘lights’. As they grow in service to Taiyang, their skin color, and later hair, lighten toward Taiyang’s golden colors. Taiyang manifests as a beautiful young Shu-shi with golden hair, skin, and eyes. She has no known less-conspicuous manifestation; her alternate manifestation as a golden phoenix is even more noticeable. This goddess of strength and of the ocean is Taiyang’s mentor, training her to the responsibilities she will assume when she inherits her mother’s position. Despite this responsibility, she could not resist Taiyang’s beauty and spirit and has become her lover as well. Her shrines are located on the shore, and ideally on islands somewhat offshore. They are strongly built of stone to withstand the weather and fierce waves of the sea. Prayers are offered daily at dawn, as the petitioner seeks strength and endurance for the day, and some foresight as to the unavoidable things that are to come. Followers are called Langchao, ‘tidal waves’, for their great strength and indefatigable spirit. Qiangda manifests as a middle-aged Shu-shi with blue-black hair and a determined mein. She also manifests as an immense and sinuous grey-blue sea dragon. Piao Li is the goddess of spirit of the land, and all the secrets it holds. When properly approached, she may be willing to share those secrets for the betterment of the land. Her shrines are most often caves underground, where one with great patience can listen to the earth and gain its wisdom. Prayers are offered daily after sundown, while in contact with her spirit. Ideally this means barefoot on natural stone, but barefoot in the cool earth will suffice. Prayers offered on worked stone or wood are only rarely heard, and only in great need. Followers are called Baoshi, ‘gems’. Small stones that can be great treasures. Piao Li manifests variously as a Shu-shi with iron-grey hair and earth-brown skin, or as an earth elemental. Haiyang is a river god, always happy to be moving within his limits, bringing clean and fresh water where needed. His shrines are over streams or near pools of clear flowing water, never ponds or other relative stagnant water. Many choose to bathe at the shrine for the cleanliness of the water. Prayers are offered daily at dawn, while fetching drinking and cleaning water for the day. At need Haiyang will accept water fetched for irrigation, but does not countenance more permanent irrigation methods such as ditches and channels that draw fresh water from his home. He is angered should anyone take steps to pollute his rivers and streams. Followers are called Liyu, ‘carp’. Many legends surround this fish, associating it with strength, persistence, and profit, favorable outcomes. Haiyan manifests variously as a young Shu-shi with wet hair and and large smile, a carp when he wants to wish someone good fortune, and even a river dragon when enraged. Weifeng is a goddess of purification and serendipity, and of hard work and exhaustion. Her favored aspects are only seen after being earned, as her husband Liangshi has learned. Her shrines are found anywhere Shu-shi work unusually hard, and provide places where an exhausted Shu-shi can rest for a time. They is usually some sort of incense burning to chase away unfavorable spirits and to lift the mind before the Shu-shi returns to work. Prayers are offered always at dusk, at the end of a day of work. Prayers offered to Weifeng are often shared with Liangshi, as they share all things as husband and wife should. Followers are called Fendouzhe, ‘strivers’. Regardless of ability, they can be counted on to try to achieve more, and most often this hard work pays off. Weifeng manifests as a Shu-shi, most often old when granting ease but young when celebrating a serendipitous result. Liangshi is a god of farmers and those who work long before their reward. As with his wife Weifeng, reward comes after work, and work well done is its own reward. His shrines are always located near fields and paddies, where farmers work. They are simple affairs, stone markers where a farmer can offer brief prayers on his way to and from his work. Prayers are offered at dusk, just as they are to Weifeng. Followers often offer prayers to Weifeng and Liangshi together, thanking them for the opportunity to work and improve and earn what is needed. Followers are called Nongmin, ‘farmers’, whether they sow and reap or not. Those who do not work the land but must make plans and start long before gaining from it can benefit from following this god. Lianghi manifests as an older, sun-browned and weathered Shu-shi with gnarly muscle and calloused hands. Jiachu is the god of livestock and animal husbandry. Shu-shi usually do not eat a lot of meat, subsisting primarily on grain and vegetables and fish. Meat is usually reserved for celebrations and major events. His shrines are usually located somewhat away from residences, and always downstream or far enough away from water the water supply to avoid contamination. The shrines include a sheltered area to house the livestock as needed (chicken houses, barns, and so on), and the altar is used not only for ceremonial sacrifice but for butchering. Prayers to Jiachu are offered before dawn, while the petitioner is doing the early morning chores to care for his stock. Followers are called Muren, ‘herders’. They spend much of their time ensuring their animals are well cared for and healthy. Jiachu manifests as a Shu-shi, unusually clad in leather rather than cotton or other cloth. Unless inappropriate he is likely to be mounted on a pony and holding a goad such as he might use to herd animals. This completes the first draft of all Shu-shi deities. I wanted to create a pantheon here that is easily recognizable, and I think I did that by retaining much of the ‘halfling nature’. Home, safety, predictability, and community are all major elements of that culture. At the same time, I wanted to introduce something different, to avoid the simply re-implementing a ‘normal halfling culture’. The veneer of Chinese culture — changing the milieu, the dress, and some of the social expectations — provided that, without greatly contradicting other expectations. I don’t think I could have created this pantheon for dwarves, and half-orcs would probably end up being analogues of the Mongol horde. 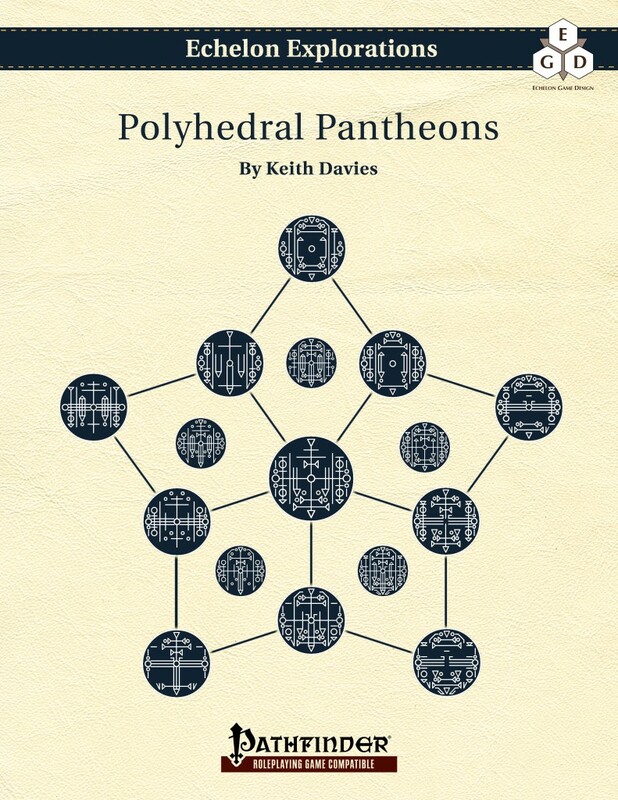 This completes 72 deities to be included as examples in Polyhedral Pantheons. There are eight more to be done, the Samoora Pantheon, then I can start my revisions and editing.